Paul Austin Murphy's : Simple Problems with the Law of Excluded Middle? 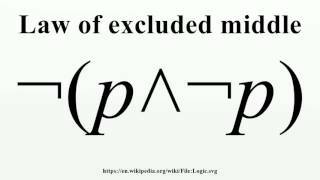 This short discussion on the Law of Excluded Middle (LEM) doesn't deal with the complexities and controversies which this logical law brings about in the area of mathematics (e.g., infinite sets, undecidables, intuitionism, etc.). For any proposition, either that proposition is true or its negation is true. Indeed the Latin has it that the law is tertium non datur: "no third [possibility] is given". "Tony Blair is either mortal or not mortal." were never uttered or expressed, then it would still be the case that Tony Blair is either mortal or not mortal. That is, if no one had ever made that statement (which they might not have done until now), or even if we didn't have a notion of mortality, then it would still be the case that Tony Blair is either mortal or not mortal. Aristotle summed up this inelegant passage much more simply when he stated that "it will not be possible to be and not to be the same thing". In propositional logic, this can be expressed as ¬(p ∧ ¬p). (Note that the Law of Excluded Middle isn't the same as the Principle of Bivalence, which states that a proposition is either true or false.) That logical statement just made (i.e., ¬(p ∧ ¬p)) includes the symbol p, which means it's about propositions. Thus the ¬(p ∧ ¬p) is a propositional version of the ontological LEM. This means that the LEM can be written in this way: ¬(A ∧ ¬A); in which A symbolises something non-semantic or non-propositional. It can be said that the statement “Tony Blair is either mortal or not mortal” also includes “hidden premises” (such as “Tony Blair is a human being”, “All human beings are mortal”, “Mortal beings die”, etc.). Alternatively, as Quine might have said, we need to know the specific definitions of the words contained in the statement in order for it to work as an example of the Law of Excluded Middle. Having said that, the symbol p can also be see as an antonym. That is, as a symbol with no specific content (as with the variables x and y) or even as being self-referential. Isn't that an instance of the Law of Excluded Middle? However, suppose this man is half in and half out of the room. In the first statement, there's a conjunctive part of the whole statement which states that the man isn't in the room at all. And in the second part, there's a conjunctive claim that he’s half in the room. So they aren't actually the same. The LEM would only be contradicted if the man were half in the room and, at the very same time, he were not in the room. (Alternatively, if half of the man were in the room and yet the whole of him were outside the room.) It's these formulations which are self-contradictory. The same argument holds. In the second statement, we wouldn't be referring to the entire ball, but only to the black part of the ball (or the non-black part). In this case, the LEM isn't about the whole ball. So if we take the black part of the ball, then it is either black or not black. If someone says, “This part isn't black, it is white”, then it's not black. So in both cases it's either black or it's not black, as the LEM states. Thus we need to specify which object or part (of an object) the statement refers to. The original claim about something being black was exclusively about the colour black, not about a black-and-white stick. To contradict it, one is essentially saying that black is not black, which is a denial of the Law of Identity (i.e., A = A). The LEM is derived from - and dependent upon - the Law of Identity. Here's another case which is highlighted by the logician and philosopher Graham Priest. Couldn't the atom be neither integral nor non-integral when it instantaneously and spontaneously decays? (Priest talks of either/or or “one or the other”; not neither/nor.) Or, alternatively, at that point in time it may not be an atom at all. This appears to be a temporal problem which must surely incorporate definitions - or philosophical accounts - of the concepts [instantaneously] and [spontaneously]. Nonetheless, if they define time instants which don't exist (i.e., the period from t to t1 doesn't exist), then Priest may have a point. However, can an atom - or anything else - “decay” (or do anything) in a “time-span” which doesn't actually exist? How can decay - or anything else - occur if there's no time in which it can occur?